In the aftermath of the 2011 English riots, many political elites, journalists and public commentators obscured the material, sociological and economic factors which contributed to the unrest and instead connected the riots to a problematic kind of 'wanting' – wanting the wrong kinds of things, in a manner and degree that was constructed as illegitimate and vulgar in a time of austerity – and thus constructing the riots as a problem of excessive greed, rampant materialism and social decay. This article reflects upon how the riots played a key role in the political production of a new cultural politics of wanting, whereby wanting is made problematic, suspect, a sign of material fixation and of irresponsible consumerism. It reflects upon this cultural politics within the current austerity regime which manifests through a celebration and romanticisation of post-War restraint and re-animation of thrift practices and frugal living. 1.1 The shooting of Mark Duggan on the 4 August 2011 in Tottenham, London, UK and the subsequent failures of the Metropolitan Police to first mediate with his family and second peacefully disperse a vigil outside the police station on 6 August 2011 escalated quickly into the events that we are all now familiar with, via (at least in part) the spectacle of violence that was replayed across televisions, newspapers and social media. Cultural theorist Paul Gilroy, in a speech given less than a month after the riots, reminds us that 'the media have a "golden hour" after the story breaks, in which they can fix the story, and then that fixed story grows, like a snowball rolling downhill. What we need to understand is that this doesn't happen by accident. These things are techniques for making information meaningful, and we need to learn from them' (Gilroy 2011). 1.2 In the immediate aftermath of the riots, two significant threads of explanation emerged before the dust had even begun to settle, 'making information meaningful' in Gilroy's terms by pre-empting/dismissing the call for sociological, economic or material investigation. The first narrative thread, of parental responsibility, quickly became a convenient alibi for enterprising politicians keen to explain civil unrest by pointing fingers at the failures of individual families. The British Coalition Government's Home Secretary Theresa May (2011a) insisted that the rioters were displaying 'sheer criminality, pure and simple' and demanded that parents keep their children at home. London Mayor Boris Johnson insisted that there was no need for sociological analysis, only swift retribution (Davis 2011). Member of Parliament David Lammy meanwhile suggested that rioting had a straightforward cause: parents have become afraid to smack their children (Anon 2012). As MP for Tottenham, where the rioting started, Lammy became a cause celebre over the course of August 2011, offering anecdotal 'evidence' across multiple platforms, claiming he had predicted the riots and a few months later publishing a 'part-memoir, part political essay' (Lammy 2011). 'Where are the parents?' became an accusatory question and political soundbite, at the same time as the consequences of the Government's restructuring/dismantling of the welfare state began to be felt particularly by families at the sharper end of global capitalism (see Jensen & Tyler 2013). 1.3 A second thread that emerged in the hasty post-riot declarations was that they were connected to an excessive and thus problematic relationship to consumption and consumer desire. This thread was given its most spectacular outing with historian David Starkey's incredible (and racist) outburst on the BBC current affairs programme Newsnight (broadcast on BBC1, 12 August 2011), which invites small panel guest experts to discuss salient topics of the day in a conversation chaired by the programme's host. Offering his explanation of the causes of the riots, Starkey insisted that the causes of the riots could be traced to the adoption of 'black culture' by white teenagers, and that 'the whites have become black'. He concluded his remarks to the visibly shocked panel by stating that 'these weren't protests, this was shopping with violence'. Williams was one of very few journalists whose initial commentary attempted to go beyond simple condemnation. Yet her article struggles to move beyond a patronising sense of the objects it might be permissible to 'want' (bread and milk) within a context of profound social and political dislocation and inequality. 1.5 In this paper I revisit some of the key statements made by politicians and social commentators, both in the immediate post-riot days and weeks, and in the year following the riots. I argue that the social unrest of summer 2011, rather than being more rightly examined within a much broader context of national and global protest and revolt which has included union marches, student uprisings and the Occupy movement (Tyler 2013a), was quickly, and successfully, re-narrated by political elites as a 'problem of wanting' in what has been (mis)labelled the 'something-for-nothing' culture. The success of this re-narration has allowed 'the riots' to consequently be co-opted by the British Coalition government as evidence of an 'epidemic of the diseased will' (Berlant 2011) and therefore of the need to extend the austerity regime and 'toughen up' its citizens. What I am calling here 'the new cultural politics of wanting' involves rewriting the problems of poverty, understood by many social scientists to be a consequence of structural inequality (Atkinson & Flint 2004; Lareau 2003; Ehrenreich 2001) into the moral failings of the individual and into a misplaced sense of entitlement among the poor. In the current austerity regime, many of the citizen entitlements to resources and social support via the welfare state are being reduced, marked as illegitimate or as requiring greater conditionality. At the same time, the entitlements of the privileged are being defended and even extended by political elites, through for example reductions in the top rate of income tax and cuts in corporation tax. Different kinds of wanting are being attached, figured and performed to differently socially and economically positioned subjects and (in)validated on that basis. 1.6 I examine how the riots, the austerity context and the emerging cultural politics of wanting are connected to the realm of the affective. The sermons of austerity position us in ways that are both social and emotional. They work through the language of emotion: through envy, distrust, disgust and shame. This article explores some of the psychosocial interpellations and invitations of austerity: the romances and promises it offers, the guilt and shame that it reproduces and the subject positions that it animates. Methodologically, I am indebted to a growing field of work that attends to the psychosocial aspects of contemporary life and to the anxieties, fears and fantasies that are at play in the production of social identity and practices which attempt to consolidate and defend social privilege (Hollway & Jefferson 2000; Vincent & Ball 2006). This field combines social science with theories of the interior and offers novel accounts of how social inequalities take shape psychically (Reay 2008), how the social world is 'desirously and defensively' appropriated (Hollway 2004) and how value systems are consciously and unconsciously reproduced and circulated which attach moral worth to specific lives and subjects through the pathologising of others (Sayer 2005; Skeggs 1997, 2004; Haylett 2001). 2.1 Valuable media analysis of the riots coverage has begun to emerge (Bridges 2012; Kelsey 2012; de Benedictus 2013; Allen & Taylor 2013; Casey 2013; Tyler 2013b; Bristow 2013). This research documents how the news coverage of the riots offers up an almost textbook case of what Stanley Cohen (1980) refers to as a moral panic, how 'persuasively paradoxical' discourses of social class were used in contradictory and complex ways, and how riotous subjects came to saturate and circulate across the media landscape as exemplars of 'failed' and improper citizenship. This paper draws on these emerging media and political analyses and I want here to reflect further upon the cultural context in which these explanations arose, and connect this to the broader post-riot imagination. The media coverage and commentary around the riots must be seen within a broader tapestry of austerity, which weaves multiple threads of moral assessment around different kinds of wanting and differently imagined futures. I position the riots as a key moment in the production of a new 'cultural politics of wanting', whereby aspirations for 'the good life', consumer desires and for socially mobile trajectories are being reconfigured, constrained and made conditional, as a consequence of the crisis of capitalism and attendant austerity. Different forms of wanting are evaluated as legitimate or illegitimate as part of the broader assessments of morality and value which are attached to particular classed and gendered selves as I explore in this analysis (see also Harvey et al. 2013). The cultural politics of wanting requires reassessments of consumption and our relationship to it, what is seen as 'over-consumption', and the re-animation of Victorian categories of the deserving and undeserving (Biressi & Nunn 2012; Gillies 2012). 2.2 The cultural politics of wanting – always simmering but spectacularly hypervisible during the riots – have intensified in this austerity era of migrating work opportunities, reducing welfare entitlements, disappearing public services, escalating housing costs, the burdens of higher education student debt, and so on. As politicians, senior police officials and media and cultural commentators struggled to make the riots coherent within existing moral frameworks, the cultural politics of wanting were transformed into a sign and a warning of the growing indiscipline of the contemporary 'family in crisis'; of 'poor parents' unable to keep their rioting children in sight, 'in line' and preferably indoors. 2.3 The discursive figures that emerged in response to the riots were multiple and serve to re-animate ideological divisions between citizens and non-citizens, between those who are seen to have rightful claims and those who are seen as draining resources from the state and its institutions via policing, social work and the welfare state. These figures include the irresponsible family, in which the rioting 'feral underclass' (Tyler 2013a, 2013b) was specifically named as a class of 'feral parents', unable to control or refusing to discipline its children (de Benedictus 2013) and perhaps even rioting with them, as was seen in the extensive newspaper coverage of 'rioting mothers' (Allen & Taylor 2012). These figures also proliferate around discourses of rioting-as-(violent)-shopping, as seen in Starkey's Newsnight 'analysis' and circulating commentary which positions social unrest as mere shopping (rather than legitimate protest) whereby rioters can be understood through their violent wanting of material goods (Biressi & Nunn 2013; Casey 2013). 2.4 The rapid propagation of these intersecting discourses demonstrates the potency of the culturalisation thesis of social mobility and immobility, which holds that economic advantage is caused principally by living well and by making the 'right' choices, and that poverty is a result of bad choices and lifestyles rather than by the entrenching of privilege across generations and results of neoliberal economic policies. These post-riot explanations, emerging almost immediately, taking root quickly in public and political imaginations, and licensing a broader dismissal of the need to understand or enquire further, illustrate a huge labour of denial around how current economic policies structurally impact upon those with the least. The speed with which the rhetoric of criminality, mindlessness and shopping-with-violence was adopted by political elites reflects broader and longer shifts in how policy has approached social and economic divisions between haves and have-nots and the poverty of imagination in contemporary political debate. 2.5 The post-riot fantasies that have emerged around austerity and its responsible embrace via practices of prudence, frugality and thrift (see Jensen 2012) have been generated in opposition to the problematic consumers and irresponsible families that were so offensively visible (or at least seemed to be) during the riots. These post-riot fantasies connect happiness and social renewal to having less not more, and serve to sanction the ideological agenda of the Coalition's austerity regime. We saw some embryonic examples of the austerity imagination in the riot clean-up movement, which recycled myths of resilience, community, and Londoners uniting in response to a common enemy. The mythology of Blitz spirit is periodically reanimated in times of crisis: Darren Kelsey (2012) has charted the fantasy of Blitz spirit that was constructed in the aftermath of the 7/7 bombings and argues that the same fantasy emerged after the 2011 riots. Such re-animations of the past are always about the present, and the Blitz spirit that manifested post-riot is saturated with contemporary class discourse; in particular, the urban antagonisms between the respectable gentrifiers of the so-called 'broom army' and the 'feral underclass' of the rioters (for a commentary on this see Himmelblau 2011; see also Casey 2013). The symbolic potency of classed discourse can be seen across the images that were posted on social media inviting 'real Londoners' to help sweep the streets and put the city back together again, under the Twitter hashtag #riotcleanup and on the Facebook event 'Operation Cup of Tea'. 2.6 These examples suture the longing for Blitz spirit and community with an ironic nod to militarism of 'Operation Cup of Tea' – even as the possibility of deploying water cannons and rubber bullets against rioters was being debated by the Government. 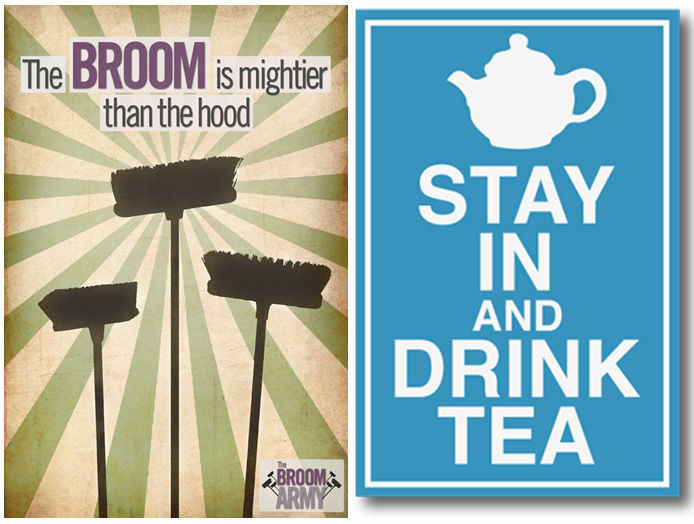 The colour filter of the Broom Army poster above firmly locates it aesthetically in post-war nostalgia as well as constructing a powerful division between 'real' (broom-wielding) Londoners and the abject (hooded) rioters. The iconography of the 'hoodie' in the UK performs semiotic shorthand and has a particular set of classed meanings, referring to hooded clothing which is assumed to be favoured by a young, urban, criminal 'underclass'. 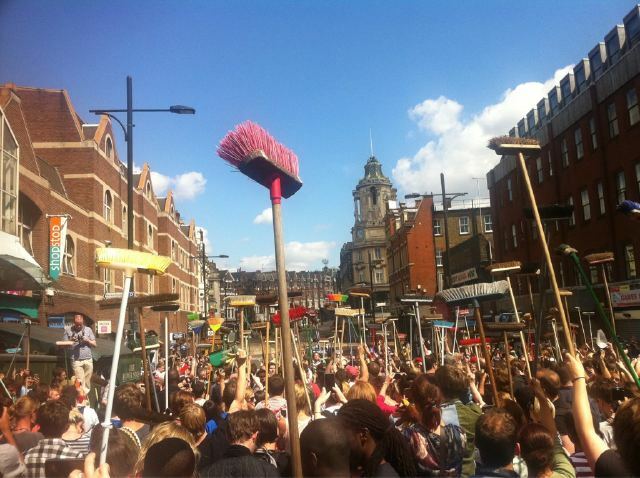 Its use here cues us to the classed fantasies of who was rioting and who was sweeping up. In turn, the circulation of these classed discourses, of urban criminality and the underclass, connects to broader overlapping discourses around supervision, discipline and family life, and specifically to the 'troubled families' who are constructed as responsible for the social unrest through their parenting failures. I turn now to the central place that 'troubled families' have come to occupy in the post-riot imagination and in emerging figurations around legitimate and illegitimate kinds of wanting. 3.1 The underclass discourse, of a criminal, irresponsible, 'feral' substrata of British society, which manifested so quickly after the 2011 riots, has not suddenly 're-appeared' in response to these events. As Tyler similarly describes in this issue (Tyler 2013b), rather, it was already there: it has been continually spoken and re-spoken through an ever-expanding palimpsest of categories. The pathologisation of particular classed selves and identification of certain families as irresponsible, criminal or failing has a complex history and is not an entirely new phenomena produced by the current Coalition Government. 'Chaotic' or 'dysfunctional' families was the preferred term of the previous Prime Minister Gordon Brown (of the Labour party), who estimated numbers of 50,000 (Brown 2009), while, post-riots, the current Prime Minister (of the Conservative party) spoke of 'problem' families, this time revising the number up to 120,000 (Cameron 2011a; see also Bristow 2013 on post-riot debates around 'poor parenting'). The discourse of 'the troubled family' is cross-party, though the origins of these 'troubled family' statistics are elusive. Cameron cited the Department for Work and Pensions who in turn cited the Department for Communities and Local Government. The original research upon which the figure of 120,000 troubled families is based was in fact conducted in 2007 by the Social Exclusion Task Force, working with secondary analysis of a longitudinal survey that was conducted in 2004. It is important to trace back the complex trajectory of this 'troubled families' number, since as Ruth Levitas (2012b) observes, while it takes the shape of a fact it is actually a factoid. 'The underclass' remains a flexible concept (in the sense that a shifting constellation of moral 'failings' can be diagnosed as its symptoms) but what remains constant across this palimpsest of categories is the claim that poverty and disadvantage are a matter of choice and can be explained through the poor lifestyle choices of those who have chosen to remain at the bottom of society in the form of a static strata of pathologically and economically dependent families. As such, underclass discourse forms a key pillar in the substitution of class politics with the culturalisation of poverty (Haylett 2001; Levitas 1998) and the emergence of new vocabularies of social class which are 'bodied forth' by political fantasies of meritocracy and enthusiastically circulated in populist languages of disgust (Tyler 2013a; see also Tyler forthcoming and 2013b). 3.3 The 'underclass' thesis was initially constructed by Charles Murray (1990) whose engineered data enabled him to proclaim that single mothers and absent fathers were a social disease and caused poverty. Murray's work has become politically reinvigorated and enthusiastically embraced by the Centre for Social Justice (CSJ), a think-tank which are highly influential in Coalition policy and led by Conservative MP and Secretary of State for Work and Pensions Iain Duncan-Smith. The prolonged attention that the CSJ bequeath to 'family breakdown' as the principle cause of poverty, and to marriage as the cure, are evident in the speed with which they proclaimed the riots to be a consequence of 'dadlessness', even before anything was known of the rioters or their family history (see de Benedictus 2013). The rhetoric of family breakdown connects powerfully to the 'epidemic of the diseased will' (Berlant 2011) which was attached to the rioters, and more broadly in the post-riot imagination and austerity era, attached to the workless, the poor and the precariously employed. The family, Prime Minister David Cameron stated in December 2011, 'is going wrong' and is perpetuating 'a culture of disruption and irresponsibility that cascades through generations' (Cameron 2011b). 3.4 The current austerity agenda positions the reduction (and in some cases withdrawal) of public services and support from such groups as a positive alternative to the welfare state system which is declared to be a burden we can no longer afford. This withdrawal and reduction of social support is here positioned as the solution for the 'epidemic of the diseased will' which specific classed subjects in the UK are constructed as suffering from. Such political appeals work by playing to the fiction that the current economic crisis has actually been caused by multiple generations of dependent, irresponsible, workless benefit claimers. 3.5 In short, the discourse of dependency actively frames the current crisis in terms of personal responsibility that has been undermined by state pampering. In this narrative, austerity is not simply a necessary imposition in the context of crisis: it is positioned as itself a solution to the crisis. The discourse of a 'diseased will' is hugely potent, as we can see in the recent fevered uptake of the 'strivers vs shirkers' political rhetoric surrounding the 2013 Welfare Benefits Uprating Bill which will further diminish the already paltry welfare payments of the working poor and unemployed. The false distinction between 'strivers' (workers) and 'shirkers' (workless) not only seeks to explain unemployment as a failure of moral fibre, it also ignores the realities of in-work poverty, which exceed the poverty caused by worklessness (see Aldridge et al. 2012; Mckenzie 2013). 3.6 The proportion of benefits paid to low-paid workers demonstrates that the welfare state, far from creating 'dependency' in the workless, in fact plays an essential role as a cushion against the low pay/precarious work that characterises neoliberal regimes. A recent poll conducted by YouGov found that the British public overestimate the costs of welfare payments, the proportion of the welfare bill which goes to unemployment benefits, the level of welfare benefits received by claimants and the incidence of welfare fraud. There remains a stubborn stereotype in the UK of the 'problem family' (see also Bristow 2013) which passes on a disinclination to work from one generation to the next and which pursues a life of relative luxury on welfare benefits. This potency remains despite empirical evidence that households where more than one generation have never worked (so-called 'inherited idleness') constitute less than 0.1 per cent of the unemployed population (see Shildrick et al. 2012). 3.7 These moral annotations around today's 'troubled families' in public, political and academic debates, work by constructing a fantasy family of the past, from which we are understood to have retreated; reproductively responsible via heterosexual marriage, financial responsibility via 'doing without' and so on. In political and cultural fantasies of a now-'Broken Britain' (such as publications produced by the think-tank, the Centre for Social Justice publications; seeSlater 2012) the modern 'disengaged' parent in the Troubled Family is positioned as 'poor' not because they are suffering from poverty but because they are evading responsibility and have lost the capacity to be financially autonomous, self-sufficient and moral disciplinarians to their children. 3.8 A powerful set of attendant fantasies are also emerging post-riots: the mirror image to the troubled, chaotic or dysfunctional family that wants the wrong things, depends upon the welfare state in order to acquire them and riots in order to attain them at opportune moments. These mirror fantasies convene around a vision of family thrift, responsibility and restraint. The new cultural politics of wanting not only assembles its pathological subjects (the shirker, the rioter, the troubled family), they also animate and validate desired and desirable selves. In the case of the austere subject, these animations operate through transformations such as becoming financially lean, embracing restraint, doing more with less and perhaps opting out of some kinds of consumption altogether. In the next section I map out the post-riot mobilisation of discourses of thrift as a positive moral virtue, which amplify and solidify the newly emerging cultural politics of wanting. 4.1 The 'generosity' of the welfare state is highly contestable (Wacquant 2009;Atkinson et al. 2012; Shildrick et al. 2012; Dorling 2010). Levels of social security payment have in fact been falling in real terms as a result of switching from Retail Prices Index to the lower Consumer Prices Index. In addition, rising prices of consumer goods, greater conditionality of welfare payment (and more punitive sanctions) and cuts in Housing Benefit (which require those in low paid work or receiving unemployment benefits to make up greater fractions of their rent shortfall) seriously trouble the notion of a generous welfare state. The preference for capping benefits rather than capping rents, the extension of the Workfare programme and the current proposals to limit the payment of Child Benefit to the first two children in an workless family, all contribute to the political narrative that many people are choosing to live 'a life on benefits' and that this 'life' is one of comparative luxury. 4.2 The welfare state is here cast as both causing worklessness, trapping the unemployed in a benefit trap where 'it pays' to be workless: even as, at the same time, worklessness is said to be 'the cause' of poverty. The resurgence of this Orwellian doublethink dependency rhetoric in a time of recession works to re-animate moral categories around the 'deserving' and 'undeserving' poor, and holding the undeserving as responsible for not only their own predicament but also for the 'bloated' welfare state. One of the most grotesque narratives that has emerged from the current financial crisis is that it has been caused not by high-risk speculative capitalism but by those who subsist upon the public purse: not just the unemployed but also the lone parent, the disabled, and the sick. The clarity of purpose in this speech is striking, particularly in terms of the certainty with which Cameron identifies the rioters as belonging to 'gangs' and 'troubled families'. Subsequent empirical research has demonstrated both of these claims are unsubstantiated. Reading The Riots (Roberts et al. 2011), a collaborative research project conducted by the London School of Economics and the Guardian newspaper, found that first, less than five per cent of those involved in rioting were involved in gang activity. Second, less than five per cent of local authorities found an overlap between rioters and those from troubled families as defined by the Troubled Families framework. The Riots Communities and Victims Panel state clearly that 'there are no data available to enable us to assess whether there is any link between the quality of parenting and the likelihood of an individual being involved in the riots' (2012: 37) and that rioter 'profiles' were far more complex. Over-stating the role of gang activity in the riots, and mis-identifying the rioters as products of 'troubled families' enabled Cameron and other political elites to dismiss any political dimensions of the social unrest and to locate it outside of a broader context of protest. Even after detailed post-riot sociological research demonstrated how inaccurate these initial claims about gangs and troubled families were, political elites have continued to cling to them (see for example May 2011b). 4.4 Despite the sociological complexities that have been unearthed in subsequent research, the narrative that the 2011 riots can be connected to a 'slow-motion moral collapse' (Cameron 2011b), particularly in reference to families and parents, has remained powerful in Coalition rhetoric. The austerity regime that has been enacted by the Coalition government and which have intensified post-riot, has become the subject of intricate semantic games – this is a period of, variously, 'austerity', 'efficiency', 'thrift' – which attempt to position the reduction of the welfare state as a virtuous withdrawal of state pampering which will 'toughen up' those who have become pathologically dependent upon it. Speaking on the flagship current affairs programme Question Time (BBC1, 10 April 2012), Conservative MP Caroline Spelman stated that 'thrift' as an economic policy works at both a household and national level, stating 'let's call it thrift then because thrift is a virtue and thrift needs to be part of the solution to our nation's problems […] thrift is living within your means'. Drawing on the positive discourses of thrift and efficiency as the reduction of waste and consumption competence, both Cameron and Spelman are in these comments redefining 'austerity' not as a dismantling of public services and assistance, but as virtuous household fiscal habits. 4.5 Austere or thrifty living is being mobilised culturally and politically in ways which obscure the structural immobility of contemporary life and circulate a 'cruel optimism' (Berlant 2011) about the future: if you can just spend less and more wisely, you will move out of debt, survive and thrive, and become happy. The erosion of the universal welfare state and the post-war social contract has continued at the same pace since the forming of the Coalition government in May 2010, but post-riots these erosions are overlaid with a new moral imperative around 'thrift' and its virtues, an embrace the challenge of 'doing more with less', finding ways to live on in a time of increasing precarity and contingency. 'Thrift' has been embraced, governmentally and individually, as a moral orientation which can cure us of our profligacy and our spendthrift habits. Thrift tantalisingly promises a future which operates through the twin deployment of consoling and constructed national nostalgias, and pathologies centred on the 'wrong' kind of family consumption (see also Casey 2013). 4.6 The cultural turn to thrift, previously a countercultural mainstay of anti-consumerist movements, gathered pace at the beginning of the global recession and is now a familiar trope across a broad range of cultural and lifestyle sites and texts. There has been a recent explosion of media content, including books, television and weblogs, which combines housewife lore, proverbs, recipes, remedies and vintage photographs. This 'new thrift' content approaches key historical eras and periods as repositories of both kitsch appeal and 'common sense' wisdom. Although thrift has always been a central and necessary component of survival for those at the sharpest ends of poverty – and perhaps we should not be surprised by the proliferation of thrift guides in a time of austerity – the shape of contemporary thrift, and the affects it attaches to, merit specific attention. Far from being a means to survival, thrift is here being promoted as a lifestyle, reinvigorated as a source of cultural value and a site of distinction (Bourdieu 1984). 4.7 The contemporary cultural expression of what I call 'new thrift' (Jensen 2012) is disconnected from working-class life, necessity and pleasure and is instead connected to middle-class romances of retreat. The embrace of frugal living across new thrift culture defines thrift as a set of habits that can fortify the individual against the toxic culture of the modern world, including wastefulness, independence-killing indebtedness and runaway mindless consumerism. The explanation for 'poverty' offered here has nothing to do with low pay, the stagnation of wages in real terms, poor education and health provision, structural unemployment or underemployment, the effects of global neo-liberalism, deregulation of social security, reforms to welfare which aggravate class fractures (and so on). Rather, 'poverty' is seen as a result of the failure to prudently use one's resources and is connected to moral conduct and responsibility. 4.8 'New thrift' thus repositions thrift not as a matter of survival, but as a matter of transforming the relationship of the self to itself. Austerity is not only fashionable (and even 'fun') but is also a source of personal self-esteem and national transformation. Many thrift authors and experts draw on the idea that current unhappiness in the Global North can be traced directly to the dissatisfactions produced within consumer culture: and that this particular form of unhappiness can be thought of as a kind of sickness, what the psychologist Oliver James has termed 'affluenza' (James 2007). One recent Guardian article declared the author's intention to spend nothing on her son in 2013 (aside from ingredients for home-cooked food and medicines) and draws on a language of 'detoxing' from the unhealthy additions of material consumption and 'going cold turkey on kiddie consumerism' (Garlick 2013). New thrift culture in these moments directly connects personal happiness with the pursuit of a more austere life. We must transform our orientations towards bad objects (consumer goods) and practice restraint and denial in order to become the morally good subjects in a new regime of happiness. 4.9 As Sara Ahmed (2010) so eloquently argues, the current fixation on 'happiness' in a time of economic crisis demonstrates the powerful regulatory power of happiness: the crisis of happiness is explained not through a failure of the social ideals that underpin the promise of happiness, but our failure to follow those ideals (2010: 7). To that end, cultural texts which promise to train us how to be better citizens operate through their promise to illuminate what is understood to be the path to happiness: in the present austerity regime such illuminations revolve around how to survive and thrive on less and less, how to achieve proximity to the good life as your income stagnates and a greater proportion of it inescapably goes to housing costs, fuel and food, and to smile while doing so. 4.10 The self-help end of austerity culture has exploded in the last three years in particular. Like other avenues of transformation culture (such as parenting, see Jensen 2010; Ouellette & Hay 2009; Bristow 2013), social problems are relentlessly individualised and psychologised with the responsibility falling on the flawed, damaged or incompetent subject and their 'bad' cultural choices. In this vein, UK lifestyle television has been able to quickly exploit the cultural politics of recession, developing a self-help genre of 'austerity chic' which can be seen in programmes such as Economy Gastronomy (BBC2, 2009) Superscrimpers (Channel 4, 2011, 2012) and The Ultimate Guide to Penny-Pinching (Channel 4, 2011), all of these promise to transmit rules for 'smart' spending and instruct viewers in consumer competence and responsibility (Nunn 2011). 4.11 The retrogression of austerity chic, new thrift culture interpolates the consumer of today through post-war nostalgia, situating the past as a time of self-sufficiency, pride and ingenuity, to which we must return. New thrift television culture such as Superscrimpers makes constant use of archived black and white newsreel footage of housewives seeking a bargain in exchange for ration cards. New thrift weblogs are scattered with Vintage Wartime propaganda posters which extol the virtues of the kitchen garden, the allotment, vegetables, 'making do and mending', keeping calm and carrying on. 4.12 New thrift culture and practices are powerfully gendered as well as classed, with the resourceful housewife occupying the central position as accumulating expertise and tricks to make her money go further or find ways to avoid spending at all. Such eulogies to frugal practices illustrate the ways that 'new thrift' has become/is becoming a site where classed Others are produced and symbolically shamed for not being austere enough: those who do not re-use, recycle, upcycle, who are wasteful, who pay full price for the new consumer goods they want but do not 'need' and so on. The cultural politics of thrift is certainly about taste and taste cultures: yet its concerns are also broader than taste. 'New thrift' culture produces and circulates fantasies of the classed Others against whom austerity is positioned as necessary, and who need to re-learn the lessons of frugality (for a closer reading of the classed and gendered intersections of new thrift culture see Jensen 2012). 4.13 The echoes of 'Broken Britain' rhetoric are stitched through 'new thrift' culture, which insists that fiscal crisis and insecurity is a consequence of spendthrift habits, consumer incompetence, and a broader cultural forgetting of how to survive on the breadline of poverty. It also, I would argue, illuminates the new class discourses of contemporary Britain, whereby conspicuous non-consumption – or what I have called here the new cultural politics of wanting – is emerging as a new marker of cultural value. The positioning of the riots as motivated by a particular kind of 'wanting' which is formulated as problematic and abject through its attachment to material consumption and consumer society. This positioning both obscures other motivating factors (such as police antagonism, stop and search, Mark Duggan's death and so on) and makes consumer 'wanting' problematic, illustrates the renewed (classed) idealism of restraint, modesty and self-discipline. In new thrift culture, the daily humiliations of post-War rationing – the drudgery of visiting multiple shops every day for basic goods that were not available, the repetitive and often poor-quality ingredients, the petty oppressions of shopkeepers and bureaucrats – are entirely ignored and rationing is rewritten as an entirely beneficial solution to contemporary over-consumption and wastefulness. Historian David Kynaston documents the quiet desperation and relentless hunger of the rationing era in his often-heartbreaking Austerity Britain (2007), which draws on Mass Observation diaries and interviews, to paint a vivid account of dirt, damp, weariness, scarcity and avarice. This powerful book offers a sobering counterpoint to the rationing fetish of 'new thrift' culture and constitutes an important challenge to political rhetoric which positions the tightening of public support and services as empowering and enabling to the poorly paid and precariously employed who are most impacted by austerity regimes (see also Mckenzie 2013; Tyler 2013b). 4.15 Thrift authors and pedagogues endeavour to create new forms of what I would term 'tightwad pride', an affective expression which is deeply classed in this context: taking pride in being 'cheap' is surely only possible when it is experienced as an option one has chosen, not out of necessity. Pride and its affective twin of shame (Munt 2007) are the powerful affective outcomes of thrift culture: look how little I have paid for this, look how much I have saved by mending, recycling, crafting, rather than buying new. If we exercise our sociological imaginations we might see a parallel process happening where rioters posted self-portraits on social media, smiling in front of displays of their 'haul': these images were often virally circulated and annotated with expressions of disgust presumably from social media users who did not participate in the riots. Although the tightwad pride that is enacted in thrift culture is distinct from the tightwad pride on display in riot-haul self-portraits – one socially sanctioned and one not – both are underpinned by the paralyzing responsibility that their authors pronounce for the fraying fantasies of 'the good life', 'fantasies of upward mobility, job security, political and social equality and lively, durable intimacy' (Berlant 2011: 3). 4.16 Although the need for austerity is spoken vis-�-vis moral anxieties about over-consumption – whereby a greater proportion of income is seen to be spent on discretionary luxuries than on necessities, and where meaningful social relationships are seen to be replaced with competitive acquisition – emerging research demonstrates that the impact of austerity continues to be hardest felt by those with the least household fat to trim (Levitas 2012a; Atkinson & Savage 2012; Jensen & Tyler 2013). Such thrift texts 'explain' contemporary unhappiness – and by extension periods of social unrest such as the 2011 riots – as a misdirection of energy and resources towards material accumulation, and rest on the fantasy that having less/retreating from consumption will improve your life. 5.1 New thrift rests on the fallacy that it is over-consumption which has created debt, unhappiness and the estrangement of parents from their children. For many economically crunched families, however, the issue is not over-consumption, but stagnating wages, insecure and precarious underemployment, rising basic costs of living, unregulated housing and rental costs and classed bifurcations. In this context, how can we be surprised by social unrest that fixates (at least in part) upon the temples of hyper-consumption, particularly as meaningful opportunities and futures retreat and diminish? Most troubling is the speed and efficiency with which the social unrest of August 2011 was disconnected from a context of broader protest about social inequalities and injustices and was instead re-stitched to a narrative of rampant greed, irresponsible consumerism and moral decay, in ways that served the already-in-process ideological agendas of retreating social support and re-animated punitive orientations towards the poor. 5.2 In conclusion, I want to draw our attention towards how the 'super rich' might fit into the framework of 'new thrift' culture. As the 2011 riots ended, an embryonic critique of the 'super rich' has slowly begun to emerge alongside the politically sanctioned and circulated stories of broken families and feral parents. This alternative critique is focusing on the feral elite and their drive to accumulate wealth far beyond their needs, their failure to fully contribute to the social state via tax avoidance/evasion strategies (largely sanctioned by almost three decades of successive Governments), and their ability to insulate themselves from the imposition of austerity in the name of reducing the national deficit. The top earners in Britain – those earning more than one hundred and fifty thousand pounds a year (less than one per cent of the UK population and more than six times the median wage) will from the next financial year enjoy a cut in income tax. 5.3 Some embryonic post-riot critique of the feral elite (largely taking place in counter- and alternative media spaces such as weblogs and mostly absent from major news organisations) examined the connections between the behaviour, experiences and expectations of this feral elite and the so-called 'feral underclass' of the riots. This emerging counter-narrative has rightly asked what social and political formations enable the 'super rich' to remain largely unexamined, and permitted scrutiny of the 'feral underclass' to serve as 'evidence' of a crisis of moral fibre and social responsibility. In a similar way, the interpellations of new thrift culture are to middle class subjects and through figurations of underclass others, permitting the super rich to remain largely absent from view in debates about the need to embrace thrift. This absence has perhaps been mirrored in the academy, with much late twentieth century sociological scholarship 'losing sight of elites' even though they are key 'engines of inequality' in the sense that it is wealth more than poverty that drives inequality rates ever higher (Khan 2012; Savage and Williams 2008). While I hold that simply replacing 'feral underclass' with 'feral elite' merely substitutes one form of pathologisation for another, I also hope that the return of sociological interest to the lives of emerging new elites and super rich (see Khan 2012; Sayer 2012) might offer us ways to more usefully theorise how and why moral regimes around restraint, happiness, prosperity and austerity 'house' some subjects (Ahmed 2010) over – or at the expense of – others. 5.4 In this article I have explored how specifically classed and gendered romances of austerity were mobilised in post-riot media commentary and political speech. There was no need, insisted the political elites, for a sociological analysis of the riots. The common sense explanation would be adequate, since it served an ideological agenda that was already in place and which sought to validate the roll-back of the social state in the name of personalising and individualising poverty and disadvantage. This article has examined why a closer scrutiny of the new cultural politics of wanting and restraint that are being preached within this austerity regime are, in fact, absolutely necessary. 1The Workfare programme compels those in receipt of Employment and Support Allowance to undergo 'work-related activity' (i.e. unpaid work) in exchange for receiving benefits. The programme has been the subject of intense criticism given its abysmal success figures, the high cost of implementation resulting in massive profits for private contractors (in particular the A4E company which has been the centre of a fraud investigation) and the impacts upon those already employed by employers who are able to take advantage of free Workfare labour and reduce their own workforces accordingly. 2See for example the website Rationing Revisited, whose author sets herself the challenge of feeding her family of five on Wartime rations, and claims that a return to rationing is not only viable for the modern family, but is also a way to save money, get healthy and (along with other 'drastic downsizing') be happy. The author of a related weblog, The 1940s Experiment, is currently living on Wartime rations for a year in order to lose weight. Weblogs such as this produce a romantic connection with rationing which is not supported by historical evidence. AHMED, S. (2010) The Promise of Happiness. Durham, NC: Duke University Press. ALDRIDGE, H., Kenway, P., Macinnes, T. & Parekh, A. (2012) Monitoring Poverty and Social Exclusion 2012, Joseph Rowntree Foundation, available at <http://www.jrf.org.uk/publications/monitoring-poverty-2012> (Accessed 15th Septemver 2013). ATKINSON, W., Roberts, S. & Savage, M. (2012) Class Inequality in Austerity Britain. London: Palgrave Macmillan. BERLANT, L. (2011) Cruel Optimism. New York and Durham: Duke University Press. BIRESSI, A. & Nunn, H. (2012) 'The revolting underclass: from political activism to shopping with violence', conference paper presented at 'The Riots One Year On' at London South Bank University, London, 28 September. BOURDIEU, P. (1984) Distinction, London: Routledge. BRIDGES, L. (2012) '4 days in August: the UK riots', Race Class, 54(1) p. 1–12. BROWN, G. (2009) 'Speech to the Annual Conference of the Labour Party', Brighton, 29 September. DAVIS, C. (2011) 'Boris heckled in Clapham Junction over London riots', The Guardian, 9 August. DORLING, D. (2010) Injustice: Why Social Inequality Persists. Bristol: Policy Press. EHRENREICH, B. (2001) Nickel and Dimed: On Not Getting By in America. New York: Henry Holt & Company. HAYLETT C. (2001) 'Illegitimate subjects? : abject whites, neo-liberal modernisation and middle class multiculturalism', Environment and Planning D: Society and Space, 19(3) p. 351–370. HOLLWAY, W. & Jefferson, T. (2000) Doing Qualitative Research Differently: Free Association, Narrative and the Interview Method. London: Sage. GARLICK, H. (2013) 'I'm going cold turkey on kiddie consumerism' The Guardian, 8th January. HIMMELBLAU, S. (2011) "#riotcleanup or #riotwhitewash? ", The University For Strategic Optimision, 10 August, available at <http://universityforstrategicoptimism.wordpress.com/2011/08/10/riotcleanup-or-riotwhitewash/> (Accessed 15th September 2013). JAMES, O. (2007) Affluenza, London: Vermilion. JENSEN, T. (2010) 'What kind of mum are you at the moment? Supernanny and the psychologising of classed embodiment', Subjectivity, 3(2) p. 170–192. KELSEY, D. (2012) ' Panic on the streets of London: Discourses of morality, class and confusion in the British, right wing press during the 2011 England riots', paper presented at Northumbria University, UK, 10 October 2012. KHAN, S.R. (2012) 'Elite identities', Identities: Global Studies in Culture and Power, 19(4) p. 477–484. KYNASTON, D. (2007) Austerity Britain, 1945–1951 (Tales of a New Jerusalem). London: Bloomsbury. LAMMY, D. (2011) Out of the Ashes: Britain After the Riots. London: Guardian Books. LAREAU, A. (2003) Unequal Childhoods: Class, Race, and Family Life. Berkeley: University of California Press. LEVITAS, R. (1998) Social Exclusion and New Labour. London: Palgrave Macmillan. LEVITAS, R. (2012a) 'The Just's umbrella: austerity and the big society in coalition policy and beyond', Critical Social Policy, 32(3) p. 320–342. MAY, T. (2011b) 'The lessons I learned from the report on the summer riots', Daily Mail, 18 December. MUNT, S. (2007) Queer Attachments: The Cultural Politics of Shame. London: Ashgate. MURRAY, C. (1990) The Emerging British Underclass. London: Institute of Economic Affairs. NUNN, H. (2011) 'Investing in the "Forever Home": from property programming to "Retreat TV"', in Wood, H. & Skeggs, B. (Eds. ), Reality Television and Class. London: British Film Institute. OUELLETTE, L. & Hay, J. (2008) Better Living Through Reality TV. Oxford: Wiley-Blackwell. REAY, D. (2008) 'Psychosocial aspects of white middle class identities: desiring and defending against the class and ethnic "other" in urban multi-ethnic schooling', Sociology, 42 p. 1072–1088. ROBERTS, D., Lewis, T. & Newburn, T. (2011) Reading the Riots: investigating England's summer of disorder, Guardian Shorts. SAVAGE, M. & Williams, K. (2008), 'Elites: remembered in capitalism and forgotten by social sciences', in Savage, M. & Williams, K. (Eds. ), Remembering Elites (pp. 1–24). Oxford: Blackwell Publishing. SAYER, A. (2005) The Moral Significance of Class. Cambridge: Cambridge University Press. SAYER, A. (2012) 'Facing the challenge of the return of the rich', in Atkinson, W., Roberts, S. & Savage, M. (Eds. ), Class Inequality in Austerity Britain. Basingstoke: Palgrave Macmillan. TYLER, I. (2013a) Revolting Subjects: Abjection and Resistance in Neoliberal Britain. London: Zed Books. VINCENT, C. & Ball, S.J. (2006) Childcare, Choice and Class Practices: Middle Class Parents and their Children. London: Taylor & Francis. WACQUANT, L. (2009) Punishing the Poor: The Neoliberal Government of Social Insecurity. Durham, NC: Duke University Press. WILLIAMS, Z. (2011) 'The Psychology of Looting', The Guardian, 9 August.